FULL TIMEThe Roos have come home strongly in a 63 point turnaround from half time, to beat the Tigers by 28 points. Kangaroos InterchangeLeigh Adams off due to an injury. The Tigers will be disappointed after forfeiting a 35 point lead at half time. 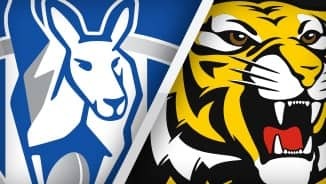 The Kangas will climb up to 7th position on the ladder after this match, whilst the Tigers season goes from bad to worse. BEHIND KANGAROOSHarvey gathers it inside 50, he looks up at goal and he misses away to the right. GOAL TIGERSThe umpire pays a push in the back free kick to Riewoldt as he kicks from 40m out, he comes in and kicks his third goal of the night. BEHIND KANGAROOSAnthony is awarded a free kick for being crashed into his back. He takes the shot on goal and pushes it away to the left. BEHIND TIGERSThompson punches it through for a rushed behind as the Roos, set to re-launch. GOAL KANGAROOSGoldstein marks 48m from goal on a slight angle, he comes in and kicks a great goal. The Roos lead by 33 points. GOAL TIGERSRiewoldt marks 40m from goal directly in front, he clears the pack in the square and scores a goal to keep the Tigers faint hopes alived. GOAL KANGAROOSNahas falls into the mark 30m from goal, he sends the Tigers a message for delisting him, by kicking his second goal of the night. The Tigers fans are spitting chips after a Riewoldt mark is denied and a free kick is given to the Roos. GOAL KANGAROOSPetrie is held onto by Rance, a free kick is awarded. He slots through his fourth goal of the night, in a return to form, after all looked grim early on. The Tigers fans will be wanting action after tonight's performance, where they have only kicked one goal after half time. This game is slipping away from the Tigers, as the Roos lead by 21 points. GOAL KANGAROOSHarvey gathers it in the goal square, as he puts the boot onto the ball and kicks his third goal of the night, running up to sit on the fence to celebrate. BEHIND KANGAROOSMaric punches it through for a rushed behind for the Roos. The Roos are building once again, could this be the official end of the Tigers for season 2014? The Tigers are down by 14 points and in the words of the Jon Cena entrance theme in the WWE, The time is right, the time is now! GOAL KANGAROOSZiebell is rewarded with a free kick for holding the ball against Batchelor. Maric gives the umpire a bit of lip, 50m penalty. Ziebell goals. This term has been a tight battle for the ball, as both teams realise that the game is on the line. The first goal of the quarter will be very important in terms of team momentum. BEHIND TIGERSVickery takes the mark 40m from goal, he takes the set shot on goal and pulls it across the face of goal. Kangaroos InterchangeNick Dal Santo off due to an injury. Kangaroos InterchangeBen Cunnington off due to an injury. Kangaroos InterchangeMichael Firrito off due to the blood rule. Welcome to Etihad Stadium for the North Melbourne v Richmond Round 12 clash. 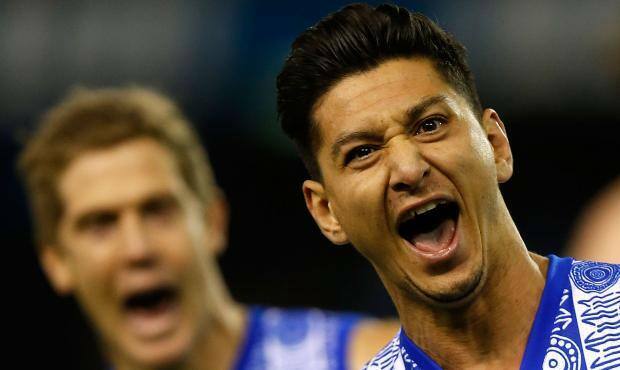 NORTH Melbourne has answered a fierce challenge to its finals credentials and probably hammered the final nail in Richmond's coffin with a rollicking come-from-behind 28-point triumph at Etihad Stadium. Trailing by 35 points at half-time, the Roos piled on eight goals in an exhilarating 19 minutes in the third quarter to set up a 17.14 (116) to 13.10 (88) victory. The storming win saw North finally shrug off its inconsistent form by stringing together consecutive wins for the first time since round four. It keeps the Roos within a game of the top four at 7-4, while the Tigers have surely seen their season slip away at 3-8. 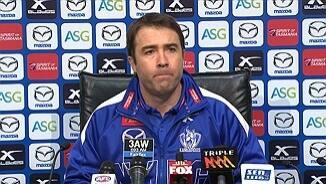 North coach Brad Scott had mixed emotions, one of them relief, post-match. "I thought it showed unbelievable resolve and character of our group to be outplayed for most of the first half and then to be able to respond," he said. "They exceeded my expectations in the third quarter so I won't be putting any ceiling on what we can do in a quarter of footy anymore." Veteran Brent Harvey again showed he is still arguably the Roos' most important player after 373 games with three goals and 25 possessions. Harvey's second major to start the third term sparked the avalanche of goals to the Lockett End. He had strong support from Levi Greenwood, Andrew Swallow and ruckman Todd Goldstein in midfield. Robin Nahas, delisted by the Tigers at the end of last year, booted two goals and fired-up the 32,977-strong crowd. Key forward Drew Petrie returned to form with four goals – three in the third quarter – and took some strong contested marks. However, it looked as though the Roos' rollercoaster campaign would continue in the first half. North was shell-shocked as Richmond came out breathing fire following a brutal review of its appalling loss to Essendon. Even before the first bounce, assistant coach Mark Williams reportedly jumper-punched Ben Griffiths on the interchange bench in a sign Richmond had come to play. Ty Vickery then marked his return by wrestling Michael Firrito to the ground and forcing the Roos veteran to seek attention for a cut under his eye. The incidents set the tone with flare-ups erupting throughout the match. The Tigers grabbed the initiative early, playing the bold and confident brand of football that lifted them to fifth last season. Richmond kicked three of the first four goals, although North steadied to only trail by a point at the first change. But Richmond's seven-goal to one second term got the Tiger Army roaring. Dustin Martin booted three of his four majors and was Richmond's best player with 28 touches, although he was well held after the main break. The Roos trailed in almost every key statistic at half-time, but bounced back to win possessions 357-355, contested possessions 143-120, tackles 76-64, clearances 36-22 and halve the inside 50 count 49-all. Their dominance was reflected by their 13 goals to three after the main break. 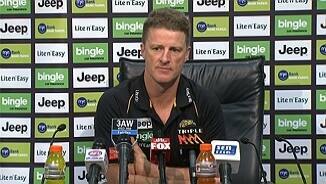 "It was a tale of two halves really," Richmond coach Damien Hardwick said. "We dominated them the first half and they dominated us in the second half. "The scoreboard reflected that. To give up eight goals in the third quarter, on the back of a contested ball smashing…You're never going to win games of footy if you get beaten that comprehensively." Jack Riewoldt kicked three goals in the losing cause, while Bachar Houli gathered 30 touches. Although North will be buoyed by the win, questions remain about Majak Daw's position after he was substituted out of the game at half-time with minimal impact.